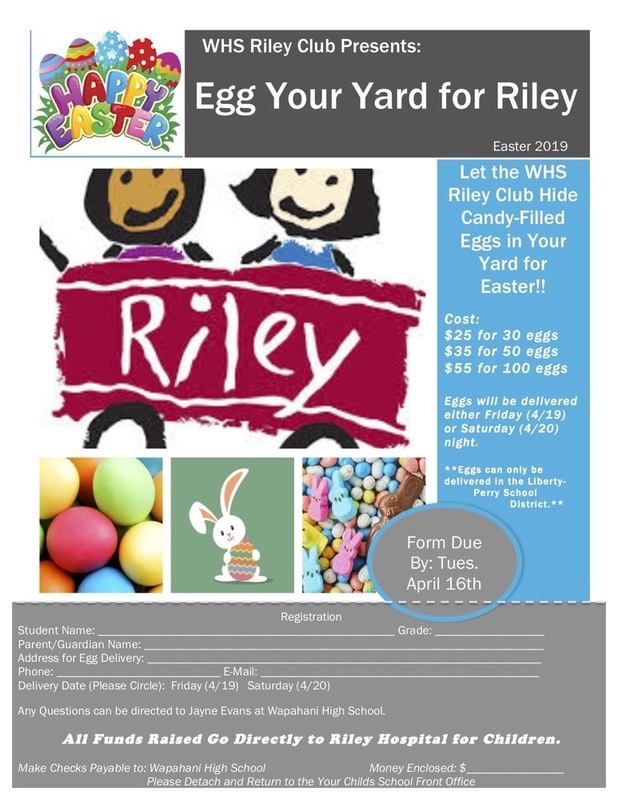 Riley Club Fundraiser - Egg Your Yard for Easter! The Wapahani Riley Club is hosting a fundraiser that will make your Easter more enjoyable and stress free! You can choose from 30, 50, or 100 candy-filled eggs to be hidden in your yard! All you have to do is pay for the amount you would like hidden and then sit back, sleep in, and enjoy the memories of watching your kids hunt for eggs! All proceeds will be donated to Riley Hospital for children. The Riley Club will also be hosting their Dance Marathon on April 27th from 4 p.m. - 8 p.m. at Wapahani High School. This event will involve the Touch-a-Truck, dancing, food, carnival style games, and more! Watch for more information to come!